Simply Wholesome Snacks. A wholesome without any of the unnecessary extras.. Made with 8 grams of whole grains, all natural flavors, and no preservatives. Two great options: Blueberry Lemon Bites and Oatmeal Raisin Cookie. 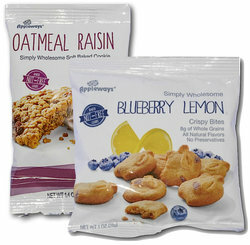 Two great options: Blueberry Lemon Bites and Oatmeal Raisin Cookie.